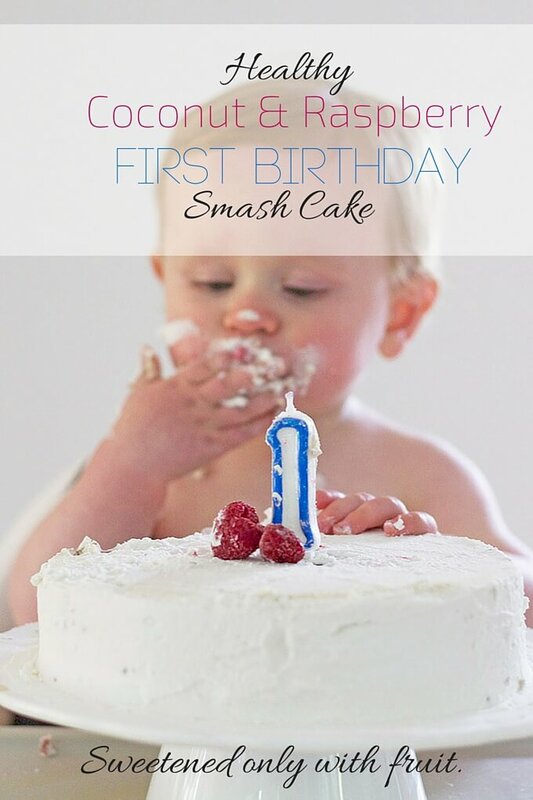 Healthy First Birthday Cake - A smash cake sweetened only with fruit. This Healthy First Birthday Cake contains no refined sugar or sweeteners, is gluten free and dairy free. It makes a great smash cake without all the refined sugar and additives. I had never heard of smash cakes until I lived in the USA. I’m not sure if this was because it is an American thing or if it was because I hadn’t had a baby until I lived there. 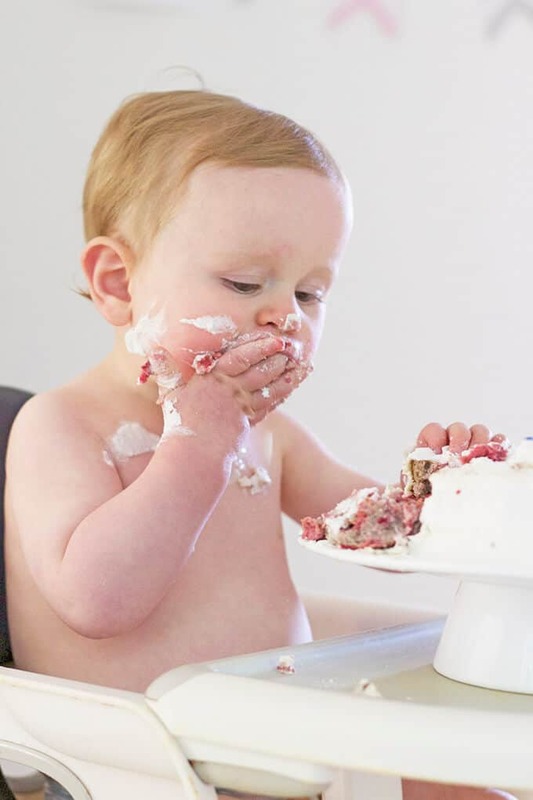 I saw so many gorgeous photos of friends’ babies covered in cake frosting and I just thought they looked totally adorable. I really wanted to make one for Finn but Finn’s first year was hectic to say the least. We moved country and moved house four times in that year (not including a couple of months living with different family members waiting for our house to be ready and our furniture shipment to arrive.) When Finn turned one we were all boxed up in the process of moving again. Making a cake was the last thing on my mind and so, instead, he got a delicious shop bought chocolate cake. We got some cute photos but chocolate probably isn’t the best colour for doing a smash cake….! Life has been a lot easier in Rory’s first year. We haven’t even moved once! I therefore had the time and energy to make a healthy first birthday cake. I wanted a smash cake without tons of sugar. I’m not totally against sugar, I do believe in balance and don’t totally restrict my kids from certain foods. However, I also believe that you can’t miss what you haven’t had. I knew that a cake sweetened with only fruit would make Rory more than happy. I found this great recipe for a banana and coconut cake which I adapted and baked in two seven inch pans. Sandwiched between the two sponges, I added a layer of this raspberry chia seed jam (but just missed out the honey when I made it) and for the frosting I covered the cake in whipped coconut cream. This healthy first birthday cake was quite dense but deliciously moist. It was a big hit with the whole family. I had to make sure that I snapped the photos quickly before Rory managed to devour the whole cake! A healthy coconut and raspberry first birthday smash cake. No refined sugar and sweetened only with fruit. Add the coconut flour, cinnamon and baking powder to the wet mixture and stir until combined. Allow the mixture to sit for 10 mins for the coconut flour to expand. Gently stir through the raspberries. Once the cakes have cooled add a layer of the jam on top of one cake and top with the other. Cover with the whipped coconut and decorate as you wish. **Whipped coconut cream doesn't work well with all brands of coconut milk. Make sure it has a high fat content. If you shake the tin of coconut milk and it you don't feel the liquid moving then this will work perfectly. Nutritional information is an ESTIMATE only, calculated using an online nutrition calculator. That cake looks so good, that baby looks like a happy baby. So it must be good! Thanks for sharing this recipe! Thanks Mergen! He did enjoy it – A LOT! Hi can I half the recipe to make a smaller cake? And also, could I sub coconut flour for wholemeal flour? I can’t wait to try this recipe!!!! Hi Su, Coconut flour is a hard one to sub out. You can’t sub it out 1:1 as coconut flour absorbs a lot more moisture. You would have to reduce the number of eggs and probably increase the amount of flour. Without experimenting I can’t give you exact measurements, sorry. The ingredients for this cake is to make 2 cakes to stack on top of each other, so if you half the ingredients you can just make 1. Hi, I’ve have just made a trial cake for my grandsons 1st birthday. The cake has been in the oven gas mark 4, for almost an hour but it hasn’t risen much and is no where near cooked. Help….. Where have I gone wrong. ? This is a very dense cake so won’t rise much. It should be cooked through though. Did you split the mixture into 2 tins? No worries thankyou ! In the recipe it says about scooping out the thick coconut cream on top of the milk… do you only use that ? Not the actual milk? Sorry for the silly question haha. I just made a practice cake following this recipe exactly and it didn’t rise at all. Not sure what I did wrong. Hi Carly, this is a very dense cake and doesn’t rise much. Did it taste cooked? Thanks Kat. Rory worked his way through the cake pretty quickly so I’m glad I went down the healthy route! Thanks Sarah! He certainly did enjoy it! Those photos are PRICELESS!!! That face could sell me that cake even if I knew it tasted like crap!!! Looks yummy for the tummy! Thank you for sharing your baking time with #foodpornthursdays. “Scoop out the thick coconut cream from the top of the coconut milk can” — am I discarding this or is this what I will be using?! Please clarify as I would like to make this for my daughters first birthday in a few days. Thank you!!! Hi Melissa, You want to use the thick creamy part. It isn’t sweet so if you are looking for something sweeter then you could always add a sweetener to it. You could use the remaining part in a smoothie! Please note that some brands of coconut milk don’t work. Give the cans a shake in the shop. The ones that seem more solid work the best. 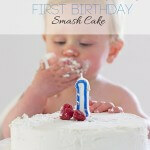 I am going to attempt this for my son’s first birthday cake smash photo shoot on Monday. Just a couple of questions first though as I am not much of a baker! How so I know that I have mixed enough and not over-mixed?! Can I just use a can of coconut cream instead of slimming from the coconut milk? How long can this cake be kept for as am planning on baking it on Friday afternoon for Monday. Does it need to be stored in the fridge to keep it fresh? Hi Hannah, Thanks for all your questions. I’m not a massive baker either and that is why I based this cake on a recipe from another site (linked) When I was making it I made sure just to mix until combined and not to continue mixing after. I baked the cake the night before my son’s birthday and it was gone by the day after. It says on the original recipe that it can be kept, in the fridge, covered for up to a week. I wouldn’t add the jam and the coconut cream frosting until the day of the party though. I’ve only ever tried making the coconut topping with skimmed coconut milk but it is basically the cream part you use so I’m guessing coconut cream would be perfect. Just remember to pop it in the fridge the night before making it. My youngest (birthday boy) loved it with just vanilla extract but my oldest (and hubby) wasn’t so keen so you may wish to add some maple syrup or powdered sugar to the frosting. Thank you Amy! I’ll be sure to share some photos with you! Great! Hope the cake is a success ? Hi, this looks fabulous! Just wondering, can I substitute the coconut flour for wholewheat flour? I am making this cake for my sons first birthday next week. I did a trial run and it’s so delicious! So happy to find a healthy smash cake alternative. Thank you! I just did a test bake for my sons first birthday and they stayed quite flat. Does this cake not rise much? Tastes fantastic though!!! HI Kat, yes the cake is pretty flat! So glad you like the taste and hopefully your son does too! Hi Amy, do you think this would work as cupcakes? Hi Emily, I’m not sure to be honest. The cake is quite dense. You could perhaps use presentation rings to cut smaller rounds from the cake and make mini cakes? Thanks, Amy. I made the cake last week for my son’s actual birthday as a trial and it was delicious! And it was much easier to than I expected too! Will be making it again this Saturday for the party! I love the sound of this recipe. My daughter is allergic to eggs so I’m wondering if I can sub the eggs for something else? Thanks for your quick reply Amy! I’ve heard of flax/chia egg alright but I’ve never been brave enough to change a recipe. Maybe now is the time! Good luck!!! I hope it works! Am I able to substitute the raspberries with strawberries. My daughter loves strawberries. And do you think that would go god with the coconut. I don’t like coconut so I’m not too sure. I’m sure strawberries would work (although I haven’t tried it personally) and I think it would go well with coconut. Sorry for the late response, a lot of my comments were going to junk and I haven’t picked them up until now. Hi Amy. I’m making this cake today. I was confused on the part that says stir through the raspberries? Do you add these into the batter? Is the 1/2 of jam and 1 cup of defrosted raspberries mix together for filling? Can you please clarify? The 1/2 cup of raspberries in the cake recipe gets mixed into the batter. To make the chia jam you need the cup of frozen raspberries. I hope this is clearer for you. Let me know if you have any questions and I hope you enjoy the cake! I just realised I forgot to put raspberries in my cake batter! Anyway, it was delicious. My dad is diabetic and he was raving about it. We had it for my daughter’s first burthday today and she loved it. We topped ours with flowers. Hi Belinda, so glad you liked it and thanks for letting me know. Loving the idea of topping it with flowers – I bet it looked beautiful ? My oh my, Amy! This cake is incredible! I have twin boys that will be turning one in a few days and I decided to make the cake for my husband and I to try before making it for the boys. I admit, I was a bit skeptical, but very hopeful. It turned out so delicious that there is very little left. Albeit, I did cut the recipe in half for the trial. I can’t wait to make it again and I’m so excited to see the boys reaction when they taste it! Thank you for the incredible recipe! Can you substitute the coconut flour for almond flour? Hi Tavan, I don’t think it would work without altering the amounts of the flour and eggs. Sorry. I’m sorry you didn’t have any success with this cake. It is a shame as I have had a lot of lovely, positive comments about this cake. People have even taken the time to send me pictures of their children enjoying it on their first birthday. Did you use the exact ingredients for the cake? Did you use coconut flour? The jam can easily be sweetened with a little honey or maple syrup (I think I mentioned this) I chose not to as I like a tarter taste and tried to keep the sugar levels to a minimum. Did you refrigerate your coconut milk overnight before hand? Did you use a high fat brand and scoop out the coconut cream from the top only? Would this work as cupcakes? If so, how long would I bake them for? Hi Sigri, I’m not sure how well they would work as cupcakes. It is quite a dense cake. You could always bake a large on and cut rounds to make mini cakes? I love your website and this recipe is exactly what I was looking for, thank you! I wondered if you could tell me how much a 1/4 cup of coconut oil is in grams? I’m a hopeless baker and things seem to come out all wrong when I measure in cups! I really want to get this right for my son’s birthday this week. Also, do you have any decorating suggestions from your own ideas or other readers? Hi Anna, I’m unsure off hand how much a 1/4 cup of coconut oil is. I’d say around 50g? Sorry. I am trying to include both cups and grams now in my recipes. I kept it simple with the decoration, just raspberries. A lot of people say that they just topped with fresh fruit. I’m going to make this for my son’s first birthday next week! Love the idea of this recipe – much nicer than many healthy cakes I’ve been looking at. Can’t wait to try it! Hi Danni, thank you. I hope your son enjoys it as much as mine did! My son will be turning one and I wanted to make this cake (soo hard to find a recipe without any sweeteners besides fruit!!) for his birthday party. I have 9″ pans, so I was thinking about either doubling or doing 1.5 times the recipe- do you think this would work okay? Also, Is this recipe enough to feed 20 people? Are they fresh or dried dates? I’m just blitzing my dried dates and they don’t seem to be coming out in a paste at all! Thank you so much for sharing this recipe! Looks delicious and I am hopeful it is the perfect addition to my son’s surf themed first birthday brunch tomorrow! Happy Holidays from Bermuda ? We just made this as a “Happy Birthday Jesus” cake for Christmas and I substituted blueberries for the raspberries; it turned out wonderful! I gave my almost two year old a piece and he loved it. Is it better to refrigerate it or keep it out on the counter like a regular cake? I would think refrigerate because of the ingredients but if you refrigerate a regular cake it dries out. Just wondering, thanks. Hi C, Blueberry sounds wonderful and I’m so glad you enjoyed the recipe. I’m sorry I’m just replying now, I switched off for Christmas. I know you don’t normally refrigerate cakes but I would definitely refrigerate this one. Hope you had a lovely Christmas. Hi Amy, cake looks delicious and I love that it’s fruit based and grain free! I was wondering if you know how many this would serve if it wasn’t used as a smash cake? If I made this the night before and stored it in the fridge, do you think it would be ok the next morning? I’ve never worked with coconut flour before! Hi Kelly, Yes – I made this the night before for my son’s birthday. Don’t add the coconut cream (if using) until just the day of the party though ?? Hi! Can’t wait to make this for my daughter’s 1st birthday next week. I’m in Israel and raspberries (and blueberries) aren’t the easiest to find. Do you think I could sub in chopped strawberries? Thank you! Hi Lani, I have never tried it so can’t say for sure but I think strawberries would be a good substitute. Enjoy! Any idea if chia seeds can be substituted? I have flax seed on hand but not chia. Hi Amy what a great recipe! I made this for my daughters 1st birthday and then again for her cake smash shoot. She loved it and so do I! I used fresh strawberries in the cake and for the chia jam as it was cheaper than raspberries and I’m not fan of frozen berries at the moment due to the recent recall in Melbourne. Worked well with fresh strawberries in the cake and for the chia jam. Now my go to healthy cake option! Hi Samantha, Thank you so much! I just loved seeing the pictures you sent me too – adorable! Hi, quick question. Have you tried doing the recipe in cupcake form? If so, should I change the cooking time or oven temp much? I haven’t tried it as cupcake form, sorry. The cake is pretty dense and i’m not sure how it would work. You could make a big cake and use round cutters to form mini cakes? Hi Amy! Thanks for this recipe. Excited to try it out. Do you think oat flour could be substituted for the coconut flour? Would it be as absorbent as the coconut flour? I’m in Nicaragua and ironically the coconut flour is VERY expensive. Thanks! Hi Carrie, I don’t think oat flour would work in this recipe due to the absorbance of coconut flour. You would have to reduce the amount of eggs but without experimenting I can’t say for sure by how much. Hi Amy, just to say I made this for my little one’s first birthday cake and it came out oerfectly, thank you for posting the recipe. He was more taken with the coconut cream than the actual cake but had some of that as well. I’ve been using quite a few of your recipes as I try to give him things sweetened with fruit only (for now) and they are always sweet enough for me too so I enjoyed the cake too! Sadly my son currently refuses to eat anything with a bready/cakey/baked oats texture (unless covered in coconut cream it seems) so I’ve eaten most of what I’ve baked using your recipes myself! Hopefully he will get over this phase soon. Thanks again! I’ve just made this cake for my little girl’s first birthday! The recipe was so easy to follow and the cake turned out perfectly. My daughter (and the rest of the family) loved it! Thanks for a fab recipe! Brilliant! So happy it worked for you, thanks for taking the time to let me know. Comments like this make my day! Hi Hem, so sorry that I am just getting back to you now on Sunday! I would keep the cake in the fridge and frost on the day. Hopefully, you live somewhere with a big enough time difference to get this in time. Enjoy! Hi Tara, it only works with tinned coconut milk (and only certain brands). Make sure it has a high fat content. If you shake the tin of coconut milk and you don’t feel the liquid moving then this will work perfectly. I am excited to try this recipe out for my son’s first birthday! Hi Lindsey, you can use fresh raspberries in the cake. I use frozen raspberries to make chia jam as they release a lot of liquid when defrosted which makes a great jam. The chia seeds absorb some of that moisture to make a more jam-like consistency. Are the chia seeds necessary? Hi Tyler, yes, chia seeds turn liquids into a gel. It is what gives the raspberries a jam-like consistency. Hi Natalia, I haven’t made the coconut milk frosting in a while, and can’t quite remember. From my research I think it will pipe, just don’t add any maple syrup as it can change the consistency. Please see my notes about the coconut frosting. It only works with certain canned coconut milk. Thank you! I made one on her birthday and then doubled it up to 4 tiers for her party on the weekend and both came out amazing! She enjoyed them so much and I loved the fact that they were still healthy for her! Thanks again for the fab recipe! Could I add (natural) food coloring to the coconut cream to give the cake some color? Hi Hannah, A reader send me a gorgeous pic of her little girl’s cake, made using this recipe. She coloured it lilac and it worked well. I have 9″ cake pans. Would that work or do I need 7″ ones? Hi Jen, sorry for taking so long to reply. You will need to adjust the cooking time / temps if using a different size pan. I think there are guides online that you can use. If I can’t find fatty coconut milk for the frosting will canned coconut cream work? Hi Maren, did you use coconut flour? Hi, Thanks for sharing this. It looks like a great cake! Can I use strawberries in the cake instead of raspberries? My little girl doesn’t like raspberries but she absolutely loves strawberries so would be amazing if I can. Hi Priya, I have never tried strawberries but someone sent me a message saying they used strawberries and it turned out great. 3 tiers later there wasn’t much left over and I ate cake for dinner ha ha ha. Also your tips were helpful especially about the defrosting of the raspberries and what kind of coconut milk go look for and keep in the fridge over night etc, and to only scoop out and use the firm part. Only thing I should have done was sift my coconut flour to avoid lumps…. It is messages like this that make my job so special! Thank you so much for taking the time to write such a lovely comment. I’m absolutely delighted that you had success with this and that it was enjoyed by all. I’m not sure if you can share photos on the blog but you can always tag me on Instagram, FB or send an email amy@healthylittlefoodies.com . Thanks again for your lovely feedback. Amy, I love this recipe! I’m all about gluten free/sugar free for my little babe! We did a faux 1st bday for my son at 9 months old because my husband had to leave for deployment. I’m making it again for his actual 1st bday. Thank you thank you! Hello! Can I sub blueberries for raspberries? I haven’t tried it but think it would work. Love the idea of this recipe! 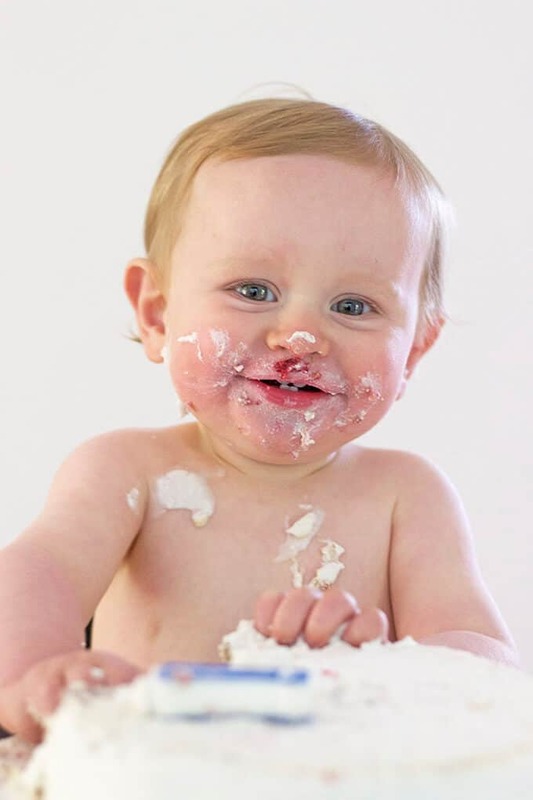 I am looking for a healthy cake recipe for my niece’s first birthday. The whole idea is to create a fondant decorated cake in her favourite woodland theme (which will be picked off of the birthday girl’s piece). Do you know if the coconut frosting in this recipe can be used underneath fondant instead of the usual buttercream? I I have never used anything like coconut milk before in baking but I suspect that it may be a little bit too loose to use in this way. Thanks Becky, I really don’t think the coconut frosting would work underneath the fondant. I think it would be too wet, sorry. I am planning to make this for my son’s first birthday smash cake and I have a few questions. I was wondering if i could use 6″ pans and how that would change the recipe and cooking time. I want it to look a bit taller but smaller in diameter. Also, what size of eggs do I use – large or extra large? If I wanted to add some maple syrup to the frosting, how much would you recommend? Also, if I use coconut cream, how much coconut cream should I add? Last thing, if i make the cakes the day before, can I stack them and add the jam in between the layers the day before or do i have to wait to do that until the day of the party like the frosting. Sorry for all the questions – I am not a baker. Hi. What brand of canned coconut milk did you use? Hi Tammy, I’m unsure, sorry. You want to shake the can, if it sounds really liquidy then it won’t work. You want to find one that you don’t feel the liquid moving in.